Today’s schools are under pressure to increase technology access, education and use for their students. UF’s College of Education is helping schools meet these 21st-century goals through a new initiative that prepares pre-service teachers with the resources and skills necessary to teach students how to effectively use and learn from technology. (From left to right) Students Kevin Autie, Katie Savitske and Meixian Shan explore elementary school-appropriate iPad applications in instructor Krista Ruggles’ (far right in background) course, Integrating Technology in the Elementary Curriculum. All they need is one tool: an iPad. 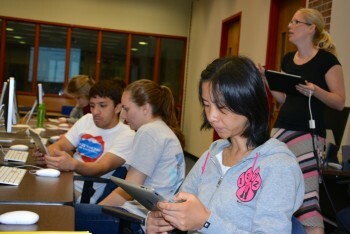 The College’s educational technology program recently purchased 20 iPads to be used in their technology integration courses. The mobile tablets were purchased through the Gilbart-Olsen Educational Technology Endowment, which was formed in 2008 with a $100,000 donation to the program from College of Education alumni Donald (BAE ’52, MEd ’63) and Helen Gilbart (BAE ’65, MEd ’67) and Norma Olsen (BAE ’76, MEd ’80). With the iPad’s built-in features like a photo and video camera, Internet browser, audio recorder, accessibility features and, of course, applications, the Apple-made tablet offers numerous educational opportunities for students, according to professor Kara Dawson. Elementary education students in the technology integration courses were able to witness this first-hand during a recent visit to Kids Count, a local nonprofit afterschool program for kindergarten through third-grade students. The elementary ed students observed as Kids Count youngsters utilized a variety of iPad apps, from “Adding Apples” to “Rocket Speller” to “Marvel Math.” The overall reaction from the young students was positive. But for COE doctoral student Krista Ruggles, who teaches “Integrating Technology into the Elementary Curriculum,” the iPad offers far more than apps.